« The 12 Posts of 2016; Happy New Year! Subscribe to comments with RSS or TrackBack to 'Collier’s Inbox 1/4/17'. Another possible option for rotation depth: John Simms, a 2013 11th round pick. He was effective (3.30 ERA, 1.079 WHIP) but not spectacular (7.7 K/9, 7.1 career K/9 in the minors) as a 24yo in AA last year. He’s kind of a poor man’s Austin Voth (who is himself a poor man’s Tanner Roark?) – even more unheralded but still plugging away with some effectiveness. I think there’s a decent chance that he starts in AAA as the swing starter. Big Fan of Simms; totally agree. I think he’s done with AA and should be in the AAA rotation to start. There’s probably a couple of guys in AA that might make 2 month promotions to AAA: Fedde, Simms, maybe even Mapes (which would be an awesome story). There’s still a huge list of former MLB arms who have no job right now that sound interesting. Henderson Alvarez? Jered Weaver? Tim Lincecum? these guys are going to pitch for someone in spring training, might as well be us. I think Cole/Voth/Fedde are fine options to have as 6-8th starters. Cole would probably be in the starting rotation for a team expecting to win 75 games, though he’s pretty much extinguished all the upside he ever had. Voth maybe has a bit more upside, but there’s always the “is his stuff good enough to get MLB hitters out” question with him that won’t be answered until he actually does it. I’m comfortable with either of those guys getting 2-3 starts if one of the top 5 has an ankle sprain or a soft tissue injury. I think either is capable of putting up 4.00 ERA starts, which is what you’re looking for from 5th starter types. Fedde, of course, has more upside. His AA stretch was very impressive statistically. If he continues to pitch that way and is healthy, I’d expect the Nats to promote him (rather than Voth or Cole) if one of the top 5 is expected to have a lengthy absence. The Nats like to go with their premier arms in these situations – Karns in 2013, Ross in 2015, Giolito/Lopez in 2016. Whatever you think of the return, the Eaton trade made sense in that the Nats were trading from a position of strength in terms of MLB-caliber starters. They’re weaker now, but still in a good position. I’d like to think Voth is the next coming of Roark; lesser velocity but good control. We won’t know til he gets a shot in the majors. FWIW, Voth had better AAA numbers than Cole last season in nearly every category. The question does become whether the big club keeps one as a “long man” or wants to keep them “stretched out” in Syracuse. Of the signees thus far, I’m particularly intrigued by Jacob Turner. He won’t even turn 26 until during the season. He’s struggled the last couple of seasons, but he has considerable MLB experience and still throws mid-90s. If Maddux/Spin Williams/Menhart can straighten him out, he could be a find. I do expect another Latos-type signing or two, though. Beyond these guys, both Simms and Mapes could still be sleepers. I don’t think they’ll be in any haste with Fedde. All in all, I think the Nats are in better shape at long-man/6-7 starters than they are in backup infielders. There are plenty of INFs still available, but only a handful who can play SS, and only one of those who can actually hit: Mr. Drew, and fact well known by Mr. Boras. Every team has holes, the only one that truly concerns me is the lack of middle infield depth. 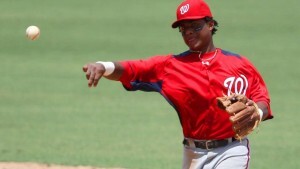 The good news, with 3 spots open on the 40 man, they can move pretty quickly once Drew signs with Nats or someone else. Can’t wait for the presser if Drew signs with the Nats where he says he wanted them all along. Backup middle infielders are very easy to find and there will be a handful of them on the waiver wire. If the Nats are happy with Difo in the utility spot (which I am), then there is no rush IMO to pick up a guy comparable to Drew (who had vertigo last season and who had 3 bad seasons prior to a decent 2016 campaign). OK, let’s try to wake up this dormant thread. There’s guaranteed Nats news today. There is almost never any drama with the Nats and arbitration, and sometimes they manage to get guys signed for a couple of years at a time, even Boras guys. Very doubtful they could get years beyond arb for Boras clients Harper and Rendon, but maybe a contract with Roark to buy out arb plus add a couple of years? I assume they’ll also be trying to get Norris at below arb value after his horrendous season, like they did with Sheriff Lobo. I’ll post something for Arbitration day!